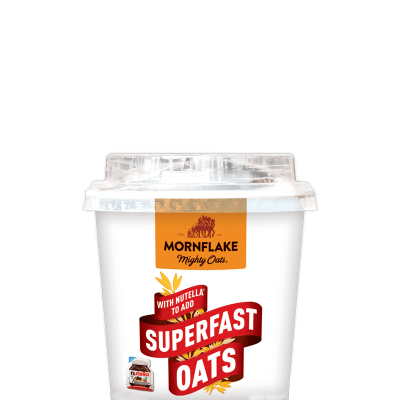 If you like your porridge simple and deliciously filling, you’re going to love this on-the-go pot. There’s no sugar in our Superfast Oats, which are cut and rolled to help water absorb quickly, so we’ve added a mini pot of Lyle’s Golden syrup for drizzling, to allow you to choose the sweetness. Mornflake OATFLAKES (55%), Lyle’s Golden Syrup® (Partially Inverted Refiners Syrup) (24%), Dried Skimmed MILK. For allergens, including cereals containing gluten, see ingredients in BOLD. Also, not suitable for NUT, WHEAT, BARLEY, RYE or SPELT allergy sufferers due to the methods used in the manufacture of this product.